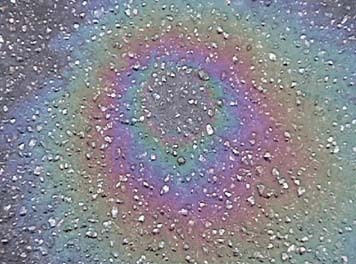 The interference colors from an oil film on water can be related to the thickness of the film by using the interference condition and noting that there is a 180 degree phase change upon reflection from the film surface, but no phase change for the reflection from the back surface. 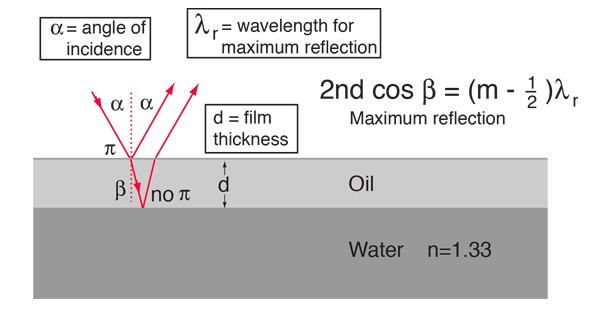 This presumes that the index of refraction of the oil is greater than that of the water. The color seen depends also upon the angle of view. This is an active graphic. Enter data below and then click on the rectangle for the quantity you wish to calculate. This is an exploratory calculation which will calculate the wavelengths for maximum reflection and transmission, the thickness of the film, or the angle of incidence. Enter the needed data and then click on the rectangle for the desired quantity in the active graphic above. Notes: The range of parameters which gives reflected or transmitted light in the visible range (roughly 400 to 700 nm) is very limited. If no parameters are entered, their values will default to incidence at 30°, n=1.42, and reflection in the green at 550 nm. All parameters may be changed, but calculated wavelengths outside the visible may not be at all reliable since the values usually given for indices of refraction are for the visible range only. If you see a visible color reflected from an oil film, you can get an approximate wavelength from a diagram of spectral colors, but there is no simple way to determine what order of reflection you are seeing. 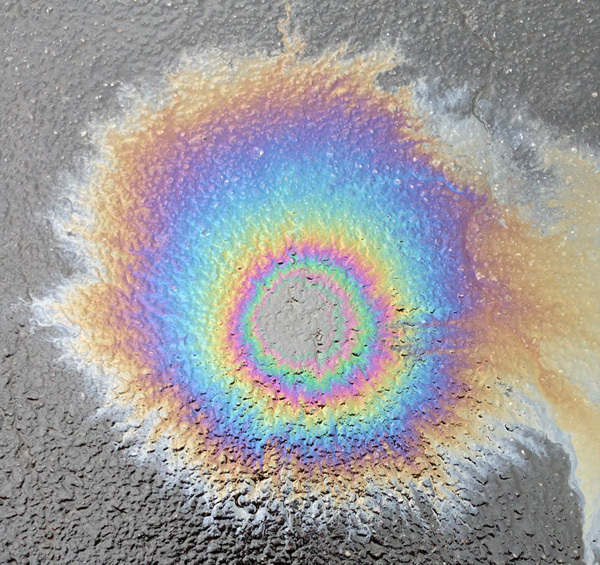 The cause of this interference pattern is gasoline or diesel fuel on wet asphalt. The temperature was close to freezing, so it would be interesting to know the effect of the increased surface tension of the water on the spread and thickness of the fuel.